DELEGATES from supply chain companies throughout the UK are already signing up for the 2011 PILOT Share Fair, ensuring they will be among the first to hear from major operators about future projects on the UK Continental Shelf (UKCS). The event, to be staged at Aberdeen’s Exhibition and Conference Centre on November 6, is sponsored by CAN and is attracting businesses from locations as diverse as Ross-shire, Northumberland and Berkshire. Ken Cruickshank, supply chain manager at Oil and Gas UK, said: “Last year’s PILOT Share Fair broke all previous records for attendance, and throughout the UK the event continues to attract increasing interest. “Across the industry, the pilot Share Fair is perceived as an invaluable opportunity to engage in open and constructive dialogue regarding the projects, investment and employment planned over the next 18 months. “Two thirds of all new fields in the UK are likely to be developed as subsea tiebacks, either because they are remotely located, have reduced reservoir sizes or are being developed in deeper water. “Therefore, we are pleased to announce that a major subsea services company, Subsea 7, will be joining the line-up of major contractors showcasing their projects this year. “Joining Subsea 7 will be speakers from a broad cross-section of the contractor community, including AGR Petroleum Services, Aker Solutions, AMEC Group, OGN Group and Petrofac Facilities Management. However, OGUK’s business confidence index for the second quarter of 2011, which was published in August, indicated that the outlook of the operator and contractor communities remains fragile. There are opportunities for business development at every stage of the industry’s life cycle, so being on the spot to hear the latest update will benefit all those attending. More than 1,000 delegates from small to medium sized supply chain companies are expected to attend to find out about integrity projects, upcoming drilling programmes, technology requirements and plans for operations and maintenance. In addition to the presentations delivered by 15 operators and contractors, PILOT Share Fair will also provide delegates with the chance to book one-to-one appointments, for which bookings open on September 14. 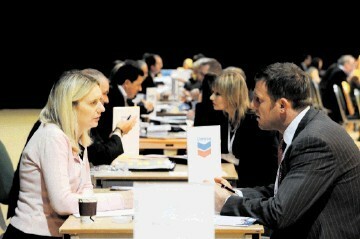 The feedback from delegates attending the 2010 event was positive. For operators the PILOT Share Fair provided the opportunity to engage with supply chain companies in an open forum and identify innovative value-adding technologies and new entrants to the market. Small to medium-sized enterprises in the supply chain said the event provided invaluable access to key decision-makers, such as client contract and purchasing teams. Participation at the share fair is an important part of signatories demonstrating compliance with the Supply Chain Code of Practice, which aims to drive out waste and boost competitiveness.